the front parking, tail, license plate, and instrument panel lights will come on. position, and the headlights will come on and all the other lights remain on. CAUTION Use the headlights with the engine running to avoid discharging the vehicle battery. indicator light illuminates (blue). 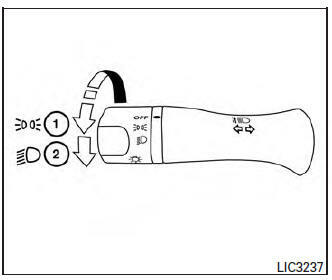 For additional information, refer to “Headlight control switch” in this section. Pull the lever back to return to the low beams. 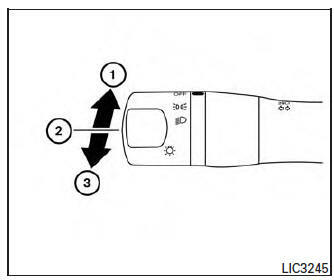 Pulling and releasing the lever flashes the headlight high beams on and off. The low beams need not be on for this function. turn off after a period of time. CAUTION Even though the battery saver feature automatically turns off the headlights after a period of time, you should turn the headlight switch to the OFF position when the engine is not running to avoid discharging the vehicle battery.